A shoehorn if there ever was one, but he's wearing a cowboy hat so maybe this won't get panned too badly. Kept looking for cowboys this week to no avail. On the way home from picking up my daughter at Grandma's house in Yountville, decided to pull over and shoot this statute above Hwy. 29 just as it enters the Napa Valley. Light was bad, people were about taking their own pics and messing with my angles, and I was generally uninspired. A recipe for disaster, but I still think this one came out pretty good. Expecting a mid-5 score, possibly sub-5 if there are too many DNMCs in the votes. Is this a statue? Nice perspective. A little more at the bottom would make it feel less clipped. Very interesting shot, but I can't quite tell what he's doing, and I'd like to see his face. Like the strong foot, though. different take on this challenge. 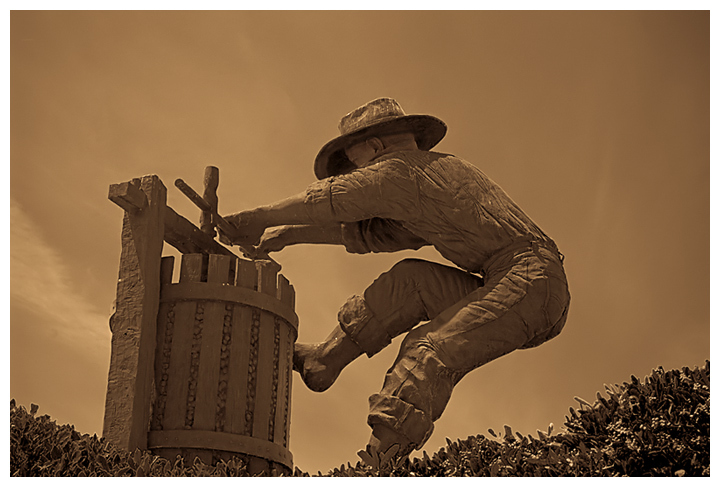 Are 'Grape Wranglers' cowboys?! Looks like a statue you'd see at a winery. As a photo, the image is composed just fine. The colorcast is a little on the orangy side IMO. Good luck in the challenge. Proudly hosted by Sargasso Networks. Current Server Time: 04/19/2019 04:16:26 PM EDT.